I have a gift certificate for an amazing body treatment and facial still sitting on my dresser from one of my dearest pals. That is how much I don’t dive into beauty treatments. I should – I just have a hard time (like many working moms) giving myself that extra something. This reason made me want to find the best and bring the best into my studio locations starting with East Hampton. I really believe in people shining their light as bright as possible, and if you have the time and the budget I recommend you see the genius Dr. Bernstein! I have personally never had a laser treatment, but I can’t wait to try and am so incredibly honored to have his brilliance accessible to all of you this summer! We are expanding our studio offerings with a residency by Dr. Eric Bernstein, M.D., M.S.E. at our East Hampton location to help clients take better care of their skin. 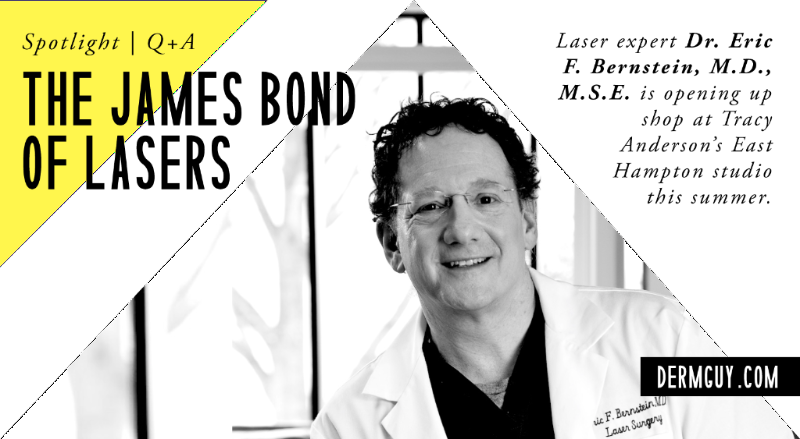 Dr. Bernstein and his team of skin care professionals will offer clients and Hamptons residents with a curated menu of skin treatments throughout the summer including skin cancer screenings, laser hair removals, skin rejuvenation services and facials. OK, SO BEING BASICALLY THE JAMES BOND OF LASERS; WHAT ATTRACTED YOU TO THE LIGHT? WHY DID YOU CHOOSE TO ‘’FOCUS IN” ON BECOMING A GLOBAL LEADING EXPERT IN LASER WORK? Despite not seeing myself as a nerd, I have always had a love and passion for physics. In particular, I became enamored with light through studying astronomy in college where I had a particularly inspiring teacher (who I recently re-connected with by the way). I actually remembered as a kid that the Apollo astronauts left mirrors on the moon to reflect lasers so we could more accurately measure the distance to the moon. How cool is that? Then, after medical school, I did research at the National Institutes of Health (NIH) studying laser-activated drugs for treating cancer. I got to use lasers and became absolutely enamored with them. Added to this, was my first research task out of residency: to study the effects of ultraviolet light on skin-a topic that would consume my research for a quarter century. The physics of lasers and the biology of how they affect skin became my academic, research passion; while in the clinic it was lasers and their effects on skin (and laser safety-that’s just my nature). I can’t imagine a doc working with lasers and NOT becoming totally enamored with them. AS PEOPLE AGE I FEEL LIKE IT’S A LOT LIKE FITNESS, WHERE IF YOU DON’T TAKE GREAT CARE OF YOURSELF, OVER TIME YOU, ALL OF A SUDDEN, DESPERATELY WANT QUICK FIXES THAT MAY LEAVE YOU WISHING YOU HAD BACK THE “BEFORE THE PROCEDURE” YOU. TELL ME WHY PEOPLE SHOULD CONSIDER LASER WORK BEFORE INJECTIONS OR GOING UNDER THE KNIFE? Aging is of course, something we cannot avoid; however, most people do not realize that the great majority of changes we associate with an aged appearance are actually a result of sun-exposure (and smoking for those who smoked). This is easily seen when looking at the skin on our bottoms, and comparing it to the skin on our faces-both are obviously the same age, but our facial skin has had to bear the insult of constant sun-exposure. I believe that we should do whatever we can to feel better about ourselves or improve our appearance, as long as it’s low-risk. Why not? To me, this means being conservative (I’m that way by my nature), and slowly walking up the ladder from mild to aggressive, if necessary. Many mild treatments are the most effective, by the way. Just because a treatment is harsh, or has some down time, it isn’t necessarily more effective than treatments with no downtime-in fact often the opposite is the case-the key is knowing which treatment to offer, AND having all the options at one’s disposal. I’ve been very lucky in that regard, as I have every possible laser (or energy-based device that’s not a laser) I could want. This comes from working with the leading laser companies from the beginning of this relatively young field of medicine. Many of the lasers I have in my office, I was lucky enough to be the first one in the world or the U.S. to use and develop treatment parameters for (see www.dermguy.com under my bio for a list). I would put toxins, like Botox or Dysport, in the category of mild treatments with lasers, and many fillers as well. Surgery, of course, can be the solution for a number of problems, but I always believe we should start with mild treatments and work our way up (or not). This, by the way, includes topical treatments, which in the context of fighting skin aging, has been a passion of mine since my early years in this field. I have consulted for numerous skincare companies, and finally at the urging of patients and colleagues started one of my own. Because topicals are used every day, they are the bedrock of any skincare regimen. I AM GOING TO ADMIT SOMETHING TO YOU RIGHT NOW. I HAVE NEVER SMOKED OR HAD ANY OTHER UNHEALTHY ADDICTIONS, HOWEVER, I WAS ADDICTED TO THE TANNING BED FOR YEARS AND YEARS ANNNNNNNND YEARS. FOR PEOPLE LIKE ME WHO HAVE PUT THEMSELVES THROUGH LESS THAN IDEAL ANTI-AGING PROTECTION, TELL ME: HOW CAN I TRY TO HELP UNDO SOME OF THE DAMAGE? Well Tracy, I have seen you, and you are a perfect example of how life can be unfair. Super light-skinned people like me (I’m a red-head who has gone brown-check my eyebrows) are super susceptible to sun-damage, and thus show the 5 KEY SIGNS OF SKIN AGING: fine lines and wrinkles, enlarged pores, sagging skin, brown spots and redness, much more easily than genetically-superior people like you who have the ability to tan. Tanning protects our skin tremendously from the aging effects of the sun, and you are a lucky example of that.The first thing to do is something you already mentioned, and that is to visit your dermatologist on a yearly basis for a full skin exam. I only practice laser surgery now, and have done so for many years, but we try to make sure every patient that sees us visits a dermatologist on a yearly basis (or more) for a skin exam-and we help them schedule on the way out with one of our many outstanding referring docs. The first line of defense is my simple triple-threat of sun protection (see my videos on sun-protection at www.dermguy.com …there are a LOT) which is: an SPF 30 or above every single day, clear UV-blocking window film for one’s car (this is a soap box issue for me) to block UVA when we’re in the car (sadly the biggest UV exposure for most of us-we should get out more), and sunglasses with BROWN lenses. The next move is to use topicals every day to rejuvenate and protect our skin (yes, I’ve developed my own because nobody was doing it exactly the way I wanted it done www.laseresults.com). their devices work, “don’t ask me, ask the patients”. I’ve been lucky enough to have the privilege of having laser engineers in my office on a regular basis to interact with me and speak with the patients to provide feedback on laser development. These are some of my favorite days, as we can dramatically increase the efficiency of laser development, and the engineers can see all the benefits of the technologies they create, and I learn a great deal. This question will illustrate how there’s never a short answer to anything you ask me, but I’ll do my best.My favorite things about my work are first and foremost the people I get to interact with. They include my patients, my staff, laser engineers and executives, and my colleagues. With business, science, academia or just plain recreation-for me it’s always about people. Having said that, I also love the science behind laser surgery-this includes not only the physics of the lasers themselves, but the biology of the laser interactions in skin. I have studied these effects for many years, and despite administering many millions of laser pulses, I am amazed and in awe every single day by skin reactions I have literally seen thousands to millions of times. I always tell patients when I get excited by a vein disappearing before my eyes or a tattoo vaporizing right in front of me as I’ve seen thousands of times (you can see this too at www.dermguy.com), it either means I’m not too bright, or I found the right job, or both J.
I FEEL LIKE MANY PEOPLE VIEW GOING TO THE DERMATOLOGIST AS A ONCE A YEAR CHECK-UP EVENT, OR GO WHEN OR IF THERE IS AN ALARMING MOLE OR STUBBORN ACNE. CAN YOU TELL ME WHAT YOUR IDEAL PATIENT PRACTICES WOULD BE AT ANY PRICE POINT? I am a very strong advocate (some would say annoying) about getting my patients to see their dermatologist once a year (or sometimes more) for a full skin exam. This is a must. Most of the people coming to me are doing so for the results of long-term sun-exposure; this emphasizes that they need to see their dermatologist at least once a year. Of course, any time someone sees a spot that is different from the rest or one that just catches their eye, they should see their dermatologist, in addition to practicing good self-examinations. Treating acne when it starts is a great way to avoid scarring that can come from long-term acne. The good news is that there are lasers that can dramatically improve acne scarring, but the best way to beat acne scarring is to as quickly as possible treat the acne in the first place. I always tell my patients to call me if they have trouble getting into a dermatologist for an appointment, as we often have a ‘Bat Phone’ right to the derms. On that note, I believe my patients should be able to reach me whenever they need to, so each person gets my cell phone number on their first visit. IS THERE A LASER THAT ERASES MOMMY’S WORRIES!??? Being a major worrier by nature (my classic course at laser meetings is “Avoiding Complications and Maximizing Results for Laser Surgery”), if I had a laser like that, I’d be wearing it incorporated into a hat on my head, 24/7. I’m working on it and will keep you posted. I KNOW I AM BRINGING YOUR GENIUS TO THE HAMPTONS, BUT WHY DID YOU AGREE AND WHAT ARE YOU LOOKING FORWARD TO THE MOST THIS SUMMER BESIDES MAKING EVERYONE LOOK LIKE THEIR SUMMER BREAK TOOK 20 YEARS OFF OF THEIR LIFE? Well, first of all, if you’re calling me a genius then you must have spoken to my mother. She may be the only one who would refer to me as one. As always in my life, I am most looking most forward to meeting new people, making new friends and combining fun, exercise, R and R, with a sprinkling of intellectual stimulation, science, and, of course, music. My friends in Spain always talk about how we over here often “live to work, instead of working to live”. I admit that I suffer from this problem as well. From my first trip to Hamptons I have met wonderful people who make me smile, and who have embraced the pace and values of a life that reflects the spectacular surroundings. The guy who built our house, Thomas Muse, did so as such a labor of love that he’s still there working with us many months after closing and still seems to have veto power over any design decisions. He and his wife Nancy Atlas are musicians whose music I love, so I am excited to hear them play whenever I am in the Hamptons.As to why I agreed to come to the Hamptons and open at your East Hampton location, that’s the easiest question you have asked me. From the second my good friend Shelly Brown invited me to visit your East Hampton location, I was struck by the passion, enthusiasm, and sheer joy of every single person coming to work out, finishing up, or simply visiting. Your philosophy of uncompromisingly offering the BEST experience one can offer, with the absolute highest standards, all in a warm and welcoming environment is how we strive to practice every single day. I believe that it’s much more fun and rewarding to work (or play) together with like-minded people, and you and your staff are all that and more. I am super excited to get to know all of you, and make many more friends in the Hamptons, and I have no doubt that associating with you, Tracy Anderson, will be great for my outlook on health and on life. I only hope to provide the same opportunities for you and your team, by bringing my crew up to you. Lastly, I’m looking forward to relaxing dinners at Dopo La Spiaggia just like I had this winter, with Maria and a host of friends from the Hamptons and back home. I have a lot of girl crushes, but these two beauties are ones that I wanted to share with you all. Quincy Davis is one pro athlete you don’t want to miss. If your kids need an adrenaline driven role model, I feel this is your gal. She is smart, down to earth, responsible, fun, loyal and driven. WHAT DO YOU TAKE WITH YOU EVERYWHERE AND ALWAYS FROM MONTAUK? WHAT ADVICE DO YOU HAVE FOR PEOPLE WANTING TO EVEN RECREATIONALLY LEARN TO SURF IN THE HAMPTONS? Montauk Boardriders is a great place to get lessons. I would definitely recommend taking a lesson first. The summer out here gets pretty crowded especially in the water so taking a lesson is a safest for everyone! BEING A PROFESSIONAL ATHLETE YOU ARE ALSO A HUGE ROLE MODEL FOR WOMEN STRIVING TO BECOME STRONG LEADERS. WHAT DO YOU THINK KEEPS YOU MENTALLY AND EMOTIONALLY STRONG ENOUGH TO BE WHERE YOU ARE? I think where I come from is a huge part of who I am today. I love how small and close knit the Montauk community is. Getting to come back to Montauk and my family after traveling is so refreshing it keeps me going and motivated to do more. WHEN DID YOU KNOW THAT YOU WANTED TO MAKE A CAREER OUT OF YOUR TALENT, OR DID YOUR TALENT OPEN THE CAREER PATH FOR YOU? I knew surfing is what I enjoyed doing most and when I realized I could travel and make that lifestyle a job, It wasn’t even a question! I got sponsored at age 12 by Volcom and since then I have been so fortunate to travel to amazing surf destinations. DON’T YOU FEEL THAT YOU MAY HAVE BEEN BORN WITH THE POTENTIAL, BUT WITHOUT THE FOCUS, DEDICATION AND HARD WORK YOU PUT BEHIND IT, THE TALENT WOULDN’T BE ABLE TO BE DESCRIBED AS ACTUAL TALENT? I always feel like people don’t realize that talent takes so much hard work to bloom. I’ve always been pretty competitive and did every sport I could do in school. I think my competitive side was what motivated me to get better at surfing. WHAT ARE YOUR FAVORITE BEACH WEAR ITEMS? Volcom bikini, a loose cover up with some big shades. FAVORITE PLACE TO EAT? SHOP? DRINKS? Happy bowls for breakfast! I love smoothies in the morning. Left Hand has amazing coffee! Crows Nest is my favorite summer spot for sunset time. Drinks and amazing food! Salivars is another favorite, for sushi! There’s so many good places hard to choose! In the world of supermodels Hilary Rhoda is an artist. It’s one thing to be a pretty face, and another to scream pretty from the core – all the way through your finger tips and beyond. She is in control, connected, kind, mysterious, and iconic. She really works and learns with her body. Hilary isn’t simply coasting through a life gift as a genetic beauty, but rather she is consistently pushing boundaries and raising the bar at her craft. YOU ARE THE PERSON THAT MADE THE SAYING “YOU CAN MAKE A PAPER BAG LOOK GOOD” TRUE. KNOWING YOU PERSONALLY I CAN SAY YOUR INDIVIDUAL STYLE IS EPIC. WHAT ADVICE DO YOU HAVE FOR WOMEN TO REALLY OWN THEIR LOOK INSTEAD OF THEIR LOOK OWNING THEM? I think “owning your look” is really all about feeling comfortable with yourself and exuding confidence! As long as that shines through, it doesn’t matter WHAT you’re wearing… you’re lookin’ GOOD! And that’s what people will remember. I THOUGHT YOUR HAMPTONS MAGAZINE COVER LAST YEAR WAS STUNNING AS WELL AS EMPOWERING. I THINK WE NEED MORE FEMALE ROLE MODELS THAT CARE ABOUT CRAFTING THE DETAILS OF WHAT MAKES THEIR HOUSE A HOME. YOU ARE ONE OF THE HARDEST WORKERS I KNOW AND YET YOU STILL HAVE A VERY STRONG FEMININE AIR ABOUT YOU. HOW DO YOU BALANCE THE WORKING WOMAN ENERGY WITH THE FEMININE ENERGY THAT FILLS THE HOME AFTER A HARD DAYS WORK? I do work hard and love my job, but I think it’s about finding the other things outside of that that make me a happy person as a whole. It’s very similar to the way I work out every day, because it makes me feel good to take care of myself… creating a warm, beautiful home environment does the same! Cooking is a big part of that too. It makes me so happy to have friends over and cook delicious food for everyone and see them enjoying it. I like taking care of people in that way. WHY DID YOU CHOOSE TO EMBRACE THE HAMPTONS AS PART OF YOUR HOME IN LIFE? that my schedule can be very last minute, so having a house out here gives me the flexibility to be able to travel back and forth easily at a moment’s notice. I try to spend as much time as possible out here, it is quite literally the breath of fresh air I need. I also have to say that one of the things I love most is the fact that TAM is out here too. I mean, being able to come out here and still be consistent with my workouts… nothing beats that! How spoiled are we?! LAST YEAR YOU PUT A DESIGNER HAT ON AND DESIGNED MY FAVORITE SWIMSUITS OF THE SEASON. WILL YOU BE DOING MORE OF THAT? Yes! I loved that whole creative process and am definitely going to be doing more of that, so stay tuned! FAVORITE PLACES TO EAT, SHOP, GET DRINKS? I love Tenet in Southampton to shop. I get cravings for the chicken teriyaki salad from Suki Zuki in Water Mill, I call that in for take-out a lot. Round Swamp Farm in Bridgehampton is one of my favorite farmer’s markets to shop.In the summertime, there is nothing I love more than a nice big salad, and I ‘m weirdly specific about the way I make it, so I have to say that the place I frequent the most has to be Citarella for their salad bar! I do a mesclun mix with red onion, peas, corn, wild rice, tomatoes, cauliflower, feta cheese, and sunflower seeds, with balsamic vinaigrette and a squeeze of lemon on top. It sounds like a lot of toppings but I only put small amounts of each on it (like one big cauliflower floret for example, but I chop it up so it goes a long way) so it’s super flavorful and delicious! Breaking the mold is something that sure happened when ex-Abercrombie model and beyond Victoria Stokes came into the world. I am lucky enough to call her my pal. Before that, I was simply in awe of her cozy taste that seemed like she literally blossomed from the garden everyday, instead of rolling out of bed. Her passion for life, family, friendship, and home gets poured into the havens she designs. Her newly born Amagansett beauty is going to make someone very lucky and happy because anything she touches comes with magic – free of charge! WE BOTH CALL THE HAMPTONS HOME YEAR ROUND. AFTER BEING A MODEL FOR SO MANY INCREDIBLE YEARS FOR THE LIKES OF ABERCROMBIE, WHAT DREW YOU TO THE FAR EASTERN TIP OF LONG ISLAND WHEN LOOKING FOR A HOME? Honestly, I came out here kicking and screaming! We had just had our son, Harrison, and we were a couple of years into our construction / design business. A client whose apartment we renovated in TriBeCa, asked us if we would be interested in renovating and decorating their home in Sagaponack. It seemed like an amazing place to raise a little boy and grow our company at the same time. NO DOUBT OF ALL OF MY FRIENDS YOU HAVE, LITERALLY, THE COOLEST TASTE IN EVERYTHING! INSTEAD OF DESIGNING A CLOTHING LINE WHAT DREW YOU TO WANT TO DESIGN HOMES? DO YOU HAVE A PASSION PROJECT AT THE MOMENT YOU COULD SHARE WITH US? We just finished a project in the Amagansett Lanes that I’m really proud of. My husband was the contractor and we poured our hearts and souls into it. I can’t wait for someone to love it as much as we do. I FEEL THAT BUYING A HOME DESIGNED WITH AS MUCH CARE AS YOU PUT IN, IS LIKE ACQUIRING A GREAT PIECE OF ART. WHAT IS UNIQUE ABOUT YOUR PROCESS IN BUILDING HOMES FOR PEOPLE AND WHAT IS THE IDEAL QUALITY YOU LOOK FOR IN SOMEONE LOOKING TO APPRECIATE IT? What a compliment! I think Tom and I provide a really personalized experience when building and designing a home. From the moment we meet a client we are focused on understanding who they are and how they want their home to feel. We’re interested in creating homes for people to really live in, not just houses. My ideal client is someone who wants to build a family home that they see themselves growing old in. It’s such a wonderful experience to help someone dream and then bring that to life. My favorite place to eat on the entire planet is Bar Pitti ! If we’re talking Hamptons, then it would be my house for homemade pizza on the BBQ, lots of side dishes and dessert from Round Swamp Farm, and unreasonable amounts of wine ! FAVORITE CLOTHING SPOT? I will shop anywhere, anytime for clothing! I love J Crew for basics which is a little too handy in East Hampton !! I always try to sneak in a Barneys or Bergdorfs trip while in the city. A’Marees in Newport Beach is a spectacularly well edited store. FAVORITE PLACE TO GRAB A DRINK? I love Fred at the Maidstone Hotel bar ! He makes fantastic cocktails and the vibe in there is great. Especially in the dead of winter next to the fireplace 🙂 In the summer there’s not much better than a sip of Rose on a beach somewhere ! From the look of Zach and Cody you may overlook their business savvy for a Calvin Klein add because they are two of the best looking brothers on the planet but make no mistake they are super smart and know real estate like I know chocolate so basically they are the best in the business out here! HOW LONG HAVE YOU BEEN IN REAL ESTATE AND WHY DID YOU DECIDE TO OWN YOUR OWN COMPANY? We have been fortunate to be “in” real estate our entire lives; our father was in the industry and made it a point to expose us to the gamut of processes associated with buying, selling, and developing property. This business has always been second nature to us; and although we have pursued other passions, real estate has always been the backdrop of our lives. We made a calculated decision to create Bespoke Real Estate out of what we deemed “necessity”. Prior to Bespoke, we felt stifled in our servicing of the high-end of the market, and wanted to create unique proprietary systems that enhanced the experience of transacting on this level. We scrutinized and analyzed each component that goes into purchasing, selling, marketing, service, etc. and worked to improve each nuanced process, and with that diligence in place, we created Bespoke Real Estate – the first brokerage firm in the world to solely focus on properties and projects $10M and above. BEING A SAG HARBOR LOCAL MYSELF, I KNOW IT’S A VERY SPECIFIC CHOICE TO LIVE HERE YEAR ROUND AND ON TOP OF THAT, TO HAVE A BUSINESS HERE. WHY DID YOU CHOOSE THIS PLACE AS HOME? Since we were teenagers, working together and starting this business was always a part of our “grand-plan”. Long before Bespoke, it was Zach that moved to the Hamptons full-time first. He saw it as a landscape that offered not only a balanced lifestyle, but also a unique area in which we could make our lifelong dream a reality. It wasn’t long (and didn’t take too much convincing) before I decided to join him and take the leap of faith to leave my prior career and focus on our vision. We found that the Hamptons fulfilled us on many levels – it is a great place to raise a family and enjoy nature but it is also a vibrant and unique real estate market. We enjoy the sense of community that the Hamptons offers, and couldn’t imagine our lives any where else. YOU REPRESENT A COLLECTION OF THE MOST BEAUTIFUL HOMES TO PURCHASE IN THE HAMPTONS, PLUS YOU HAVE A FULL STAFF OF VERY SMART AND SAVY AGENTS, WHO HAVE ACTUALLY HELPED ME FIND MY HAPPY PLACE IN SAG HARBOR. WHILE YOU ARE THE SMARTEST CHOICE FOR SOMEONE LOOKING TO BUY, MANY FAMILIES LOOK TO RENT IN THE HAMPTONS DURING THE SUMMER SEASON, FROM A WEEK, TO A MONTH OR EVEN THE ENTIRE SUMMER. ANY ADVICE FOR THESE ”TEMPORARY HOME” SEEKERS? We are fortunate to have exceptional people who add value to Bespoke’s growth on a daily basis. Collectively, we strive for a culture that encourages positivity and the entrepreneurial spirit. We like to know that we can be fully supportive to our clients’ dynamic needs whether that be purchasing or selling a home, arranging a helicopter for an impromptu weekend trip to the Hamptons, or obtaining a beach pass, our goal is to make their Hamptons experience seamless. Our advice on the rental front is to make sure you plan in advance! There are so many amazing properties that get snatched up quickly by seasoned veterans of the Hamptons Summer; the further out you can plan your getaway, the more options you will have. Secondly, make sure your broker sets realistic expectations with a potential landlord. This helps to avoid any potential hiccups that come with renting a home for any duration of time. Lastly, learn the backroads! Time in the Hamptons is valuable, and should be spent on the activities you love. CAN YOU SHARE WITH US ANY OF YOUR IDEAL VACATION SPOTS TO OWN OR RENT HOMES? The Hamptons offers a wide array of of locations that each have a distinctive feeling. Although the “Hamptons” are often grouped together, each hamlet brings something special to the table. Outside of the Hamptons, South Florida and ski destinations, we are seeing a significant increase of travel for both purchasers and renters to exclusive high-end resorts in the Caribbean and South America. For example, we work alongside Amanera in Dominican Republic – it is the only Golf integrated AMAN resort. It is stretches miles along one of the most beautiful coastlines and offers privacy and an abundance of activities for everyone. Several of our clients have purchased and rented here. You know when you know the answers to things but you still want to talk it over with your mom or you Grandma? Well I don’t really know what I would do without my crew from Provisions. They not only walk the walk, but you can talk and boy do they have answers. I must consult with Chris, Rita and Sue most days of the week. If I have a cold or just want to rotate my probiotics properly they have real wisdom and knowledge. I am so behind this store – it’s what I dream every grocery store everywhere will be someday! WHAT ARE THE TOP 3 “TAKE-HOME” PIECES OF ADVICE YOU WOULD GIVE TO PEOPLE LOOKING TO MAKE A NUTRITIONAL YEAR-ROUND SHIFT FOR THE BETTER THIS SUMMER? Move more towards a plant-based diet. Summer and spring vibrant with an abundance of fresh local veggies. Initially, in the early months we see bitter greens and asparagus, perfect for cleansing. Throughout the summer we thrive on fruits and vegetables in the natural order of which they arrive. We must remember to follow the seasons’ harvest throughout the rest of the year. (For example, in the winter months we enjoy the comfort of sweet potatoes and leeks).Lower your intake of processed sugar. Alternately, you can switch to natural sweeteners such as yacon and date syrups, raw honey and coconut sugars. Natural whole sugars provide the body with calm and sustained energy and yield far less calories. Choose healthy fats. Cold pressed oils such as olive and sunflower oils are anti-inflammatory and can help reduce LDL cholesterol. Avocados are abundant in vitamins and minerals and ghee provides vitamin K and selenium amongst other antioxidants. WHY IS GOING THE EXTRA EXPENSE FOR ORGANIC FOODS WORTH IT TO YOUR HEALTH? Good nutrition is your real health insurance. Spending on high quality, organic and non-gmo products may eventually save you a fortune in currency and discomfort. ALTHOUGH WE ALL HAVE DIFFERENT NUTRITIONAL NEEDS, SUPPLEMENTS ARE A HUGE ISLE OF CONFUSION FOR SO MANY. WHAT IS YOUR IDEA OF A HEALTHY SUPPLEMENT REGIMEN? ‘Listen to your body’. Yes, it is true. Our health is our own personal journey. It is important to be aware of the health history of your family. Your genetic makeup is a huge consideration in your personal nutritional needs as well as the environment you live in and work in. Be mindful of any health conditions that are prevalent in your area. At Provisions, we can help you find supplements and foods which you can add to your daily regimen to keep you on guard. WHAT IS YOUR FAVORITE NATURAL REMEDY FOR THE SUMMER COLD THAT SEEMS SO UNFAIR TO CATCH? Oil of Oregano is one of our faves. We recommend rubbing it on the bottom of your feet at the first signs of a cold. IF YOU HAD 100 DOLLARS TO SPEND AT PROVISIONS WHAT WOULD BE YOUR MUST HAVES? Staples for the pantry. Good quality oils, fermented foods such as miso, sauerkraut and kimchee. Sea vegetables, Himalayan salt, raw honey and kale. Tracy Anderson will be opening of a pop-up studio in Montauk, NY for 8 weeks beginning Friday, July, 1. For the first time, Hamptons residents on the far east end will have access to the unprecedented fitness content that a Tracy Anderson Method class delivers with a daily schedule of muscular structure and TA VA dance cardio classes, specialized men’s classes, and more. Class reservations and more information will be made available at www.tracya.wpengine.com in the coming weeks!